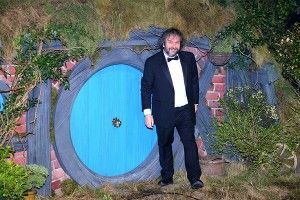 The Hobbit wasn’t quite the only gig in town this weekend, but it sure felt like it. (Note the first seven lines on Fandango’s ‘Now Playing’ list: The Hobbit: An Unexpected Journey, The Hobbit: An Unexpected Journey 3D, The Hobbit: An Unexpected Journey — An IMAX 3D Experience, The Hobbit: An Unexpected Journey — An IMAX Experience, The Hobbit: An Unexpected Journey HFR 3D, The Hobbit: An Unexpected Journey HFR IMAX 3D, The Hobbit: We Play It in Reverse and See If It Syncs Up With Side B of LMFAO’s Sorry for Party Rocking). And so, as one might have imagined, the movie did quite well for itself in its opening stretch — oh, we’re just talking about a little thing. A thing called the best! December opening! Ever! It pulled in a whopping $84.4 million, which now makes I Am Legend’s $77.2 million, from December of 2007, look like so many Pogs and Pogs slammers. Of course, this being a huge giant expensive franchise and all, that big record-breaking number still isn’t good enough to match all industry expectations. As EW explains, the numbers suffered a severe drop-off between Friday and the rest of the weekend, and so the concern might be that all the Gandalf-a-maniacs ran out to see the thing the first chance they got, and now the movie’s in for a slow and steady decline. Not that there’s that much to worry about. Internationally, The Hobbit’s already pulled in $138.2 million and has some big markets yet to open in, including China. Domestically, it’s got the Christmas break stretch — where nerds, stoners, and stoner nerds will have even more free time to watch movies — to take advantage of. And, despite lukewarm reviews for the film overall and some straight-up terrified reactions to the 48 FPS format, The Hobbit has managed an “A” Cinemascore. Plus, there’s that genius Denny’s promotion. No way The Hobbit underachieves when it’s got the home of the Moons Over My Hammy Omelette on its side.